Ross Ulbricht, the California hippie convicted for founding notorious online drug market Silk Road, has been sentenced to life in prison. The man once known as the “Dread Pirate Roberts” was found guilty on seven counts earlier this year, including a “drug kingpin” charge that carries a mandatory minimum sentence of 20 years in prison. 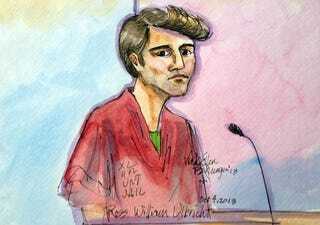 Prior to sentencing, Ulbricht’s defense argued that the online drug market Silk Road provided a safer alternative to buying drugs. Ulbricht begged the judge to leave “a small light at the end of the tunnel” by giving him a lenient sentence. Those pleas fell on unsympathetic ears. “I don’t know that you feel a lot of remorse,” Judge Katharine B. Forrest told Ulbricht. Ulbricht, a 31-year-old yoga enthusiast, didn’t fit the image of a traditional drug kingpin, but he was treated like one. Prosecutors sought a substantially longer sentence—and got it from Forrest. Forrest didn’t buy the defense’s argument that Silk Road reduced harm in the drug trade, calling it a “fantasy” according to Motherboard reporter Kari Paul. Forrest had previously rebuffed Ulbricht’s attempt to get a retrial after the two of the investigators on the Silk Road case were arrested for committing fraud while investigating the “Dread Pirate Roberts” in charge of the Silk Road. Ulbricht’s arrest and conviction haven’t slowed the online drug trade, which continues to grow in volume.